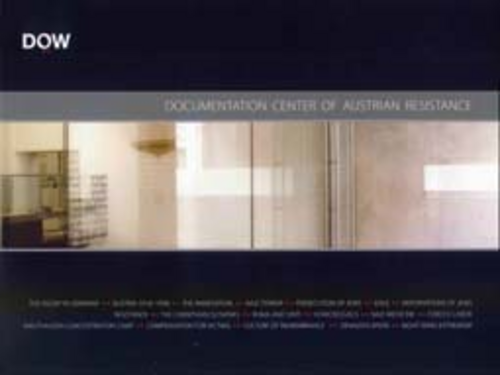 DÖW’s new designed permanent exhibition was funded by the City of Vienna as a lasting contribution to the 2005 memorial year and was opened 2005. The catalog to the permanent exhibition on hand with a collection of exhibition texts presents a survey of resistance and persecution 1938-1945 as well as of the history leading up to the "Anschluss" and of the processing of the NS-era after 1945. Thus, the non-German speaking visitors have the opportunity to revisit the topics after having seen the exhibition. The majority of authors are from the DÖW itself - they demonstrate the range and quality of research that is carried out here. In addition, experts close to the DÖW were called upon concerning special topics less studied at the DÖW such as resistance and persecution of the Carinthian Slovenes, the persecution of the Roma and Sinti, the homosexuals, the Mauthausen concentration camp, forced labor, but also the culture of remembrance after 1945. The chapter on the handling of NS-crimes after 1945 was worked on by the staff of the Austrian Research Center for Post-War Trials located at the DÖW.